The annual report for 2011 and the annual accounting reports for 2011, including the profit and loss statement, have been approved by the Decision of Shareholder of TAIF-NK PSC, the net income earned for the year 2011 has been distributed and the Board of Directors of TAIF-NK PSC has been elected. On April 06, 2012 the Deputy Minister of Finance of RF S. Shatalov has visited the area of the Nizhnekamsk industrial zone. In conjunction with the visit S. Shatalov has made a detour of industrial facilities of TAIF-NK PSC and Nizhnekamskneftekhim OJSC, and has inspected the reconstruction of the section 300 of MDHC (Middle Distillate Hydrotreating Complex) of TAIF-NK PSC. On March 15, 2012 TAIF-NK PSC has held the conference of the staff. On the meeting the collective agreement 2012 has been adopted and the results of implementing the collective agreement 2011 have been summarized. 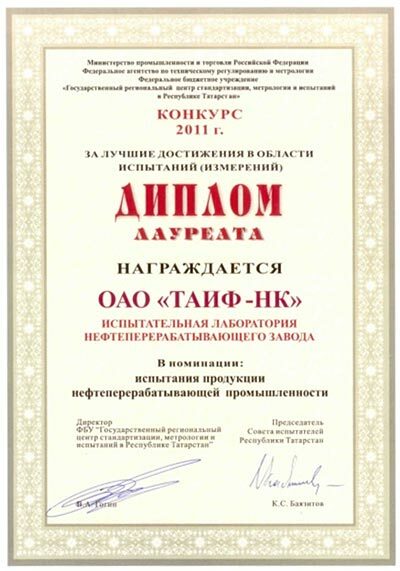 March 12, 2012 TAIF-NK is the winner of the national contest "For outstanding achievements in the field of testing"
In early March 2012, in the conference hall of the FBU "State Regional Center of Standardization, Metrology and Testing in the Tatarstan Republic" the fourth meeting of the Board of Testing and Analytical Laboratories of the Tatarstan Republic was held, which addressed issues of the Council of test, summed up the activities for the past year and set targets for 2012. February 22, 2012 The Kick-off meeting has been held to discuss the initial data for performing the basic project of VCC unit. All Annexes to the Agreement on the basic engineering have been discussed, the questionnaire "Fundamentals of basic design" has been agreed and signed. February 18, 2012 The Kick-off meeting has been held to discuss the initial data for the company “KBR Ltd”’s research of the vacuum block CDU/VDU-7 and the catalytic cracking unit. These researches are necessary to perform the basic project of VCC installation aimed to its further integration into the existing production scheme of TAIF-NK PSC. February 15, 2012 A meeting to discuss the coordination of procedures TAIF-NK PSC and the company KBR Ltd, under working on basic engineering of VCC unit. Agreed and approved the document of "Methods of coordination". Today, in the office of TAIF PSC, TAIF-NK PSC and Kellogg Brown and Root (USA engineering company) signed a Basic Engineering Contract for a VCC Unit based on a VEBA COMBI CRACKER process. The event was held with participation of the President of the Republic of Tatarstan Rustam N. Minnikhanov. February 10, 2012 A seminar on VCC technology (Veba Combi-Cracking of the company “KBR Ltd”). The Vice-President in oil refining of the company “KBR Ltd.” Anand Subramanian has held the presentation of the technology (VCC), after which there has been discussed a preliminary flowsheet of the facility and the issues of its operation. In February 2012 a supervisory audit of the integrated management system of TAIF-NK PSC on compliance with requirements of international standards ISO 9001:2008, ISO 14001:2004, OHSAS 18001:2007 has taken place.